They would be correct. It is about ten miles from San Jose. Well, according to a recent news report, Cupertino has the largest majority population of Asian Americans in the entire United States. Sixty-three percent of the city’s population is Asian American. So it’s not unexpected that local voters sent candidates of Asian descent to the Legislature and to city councils. The congressional seat was easily retained by Mike Honda, a Democrat and one of the most influential Asian Americans in Congress. His views on politics and civil rights were shaped by his internment during World War II. Honda, 71, helped build a network for Asian American political aspirants who live in Cupertino and served as a mentor for many. However, a challenger to Honda in the 2014 election may be Ro Khanna, an Indian American who served as a deputy assistant secretary of the Commerce Department and is a rising star in the Democratic Party. Honda, perhaps in one of the earliest moves to fend off potential challenges next year, recently secured endorsements from President Obama, former Speaker of the House Nancy Pelosi and other Democrats. 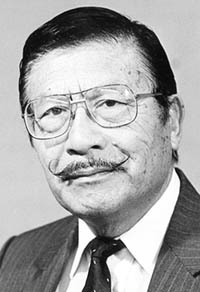 Before being elected to Congress in 2000, Honda’s district was held by Norman Mineta, who was also the mayor of San Jose. The recent wave of Indian immigrants may change the influence of Japanese and Chinese Americans in future elections. Both Democrats and Republicans have courted Indian Americans. “When a community gets more diverse, you’re going to run into that,” he added. While still touching on Cupertino, I remember about five years ago the popular Japanese supermarket Marukai, with five outlets in Southern California, announced it was opening a branch in the Northern California city. I wondered how they decided to open a branch in Cupertino. Now we know. With the story on the city having the largest Asian American population (including JAs) in the entire U.S., opening a Japanese supermarket there makes sense. A number of key employees from the Gardena branch of Marukai transferring to Cupertino is now understandable. My niece and her husband moved to Cupertino about the time Marukai opened, so I asked her if she shopped at the branch. Hey, you can’t buy natto at Vons or Ralphs. Since I lived in an area not far from Cupertino prior to World War II and the evacuation, I remember the area as an agricultural site. Lots of orchards with cherry, apricot and apple trees. Now, mostly a residential site. Back then, if someone had said that Cupertino would no longer be farmland, we would have laughed. Yeah, I always go through the pages of The Las Vegas Review Journal, the major newspaper in my favorite city. The top story this week was on a woman winning $50,000 playing bingo. She did it at the South Coast Casino, which is owned and operated by Boyd Properties. Yes, the same Boyd Properties that also owns and operates my favorite casinos to play, The California, Fremont and Main Street in Downtown Vegas. I know most of us from L.A. are patrons of above hotel/casinos. So here’s a bit of news that should make Downtown visitors happy. The hotels on The Strip will be adding an extra charge for those staying at their facilities. The new fees will start at $12.50 per night and go up to $25. So if one stays on The Strip and pays, let’s say $150 a night, he will be charged an extra $75. No explanation was given for the new assessment. Lucky for us Downtown visitors, the extra fees will not be charged there. Another short note on Vegas. My friend and owner of Umeya Senbei Company gave me a couple boxes of a new line of senbei to pass out to people I know and get a response on what they think about his new product. Well, I took one box to Vegas on my last trip and passed them out to “hakujins” at the Boyd hotel/casino. I didn’t have an answer, so I guess I’ll have to ask Tak if he has a distributor for his new, tasty senbei. If “hakujins” enjoyed it, I’m sure so will the Nisei. Well, here’s one that touches on a doctor who is now 101 and is still practicing medicine. 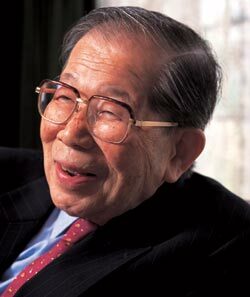 Shigeaki Hinohara of Japan is the world’s longest-serving physician and educator. His magic touch is legendary. Since 1941 he has been healing patients at St. Luke’s Hospital in Tokyo and teaching at St. Luke’s College of Medicine. He has published 15 books since his 75th birthday, including “Living Long, Living Good.” He has sold more than 1.2 million copies. As a founder of the New Elderly Movement, Hinohara encourages others to live a long and happy life, a quest in which no role model is better than the doctor himself. This is a photo of Dr. Hinohara. Doesn’t look like someone 101, does it? Dr. Hinohara’s main points for a happy life: “Energy comes from feeling good, not from eating well or sleeping a lot. We all remember how as children when we were having fun, we often forgot to eat and sleep. I believe that we can keep that attitude as adults too. It’s best not to tire the body with too many rules such as lunchtime or bedtime. “All people who live long, regardless of nationality, race or gender, share things in common. None are overweight. For breakfast, I drink coffee, a glass of milk and some orange juice with a teaspoon of olive oil in it. Olive oil is great for the arteries and keeps my skin healthy. Lunch is milk and a few cookies or nothing when I am too busy to eat. I never get hungry because I focus on my work. “There is no need to ever retire, but if one must, it should be a lot later than age 65. The current retirement age was set at 65 half a century ago, when the average life expectancy in Japan was 68 years and only 125 Japanese were over 100 years old. Today, Japanese women live to be around 86 and men 80, and we have 36,000 centenarians in our country. In 20 years, we will have about 50,000 people over the age 100. “Share what we know. I give 150 lectures a year, some for 100 elementary school children, others for 4,500 business people. I usually speak for 60 to 90 minutes while standing to stay strong. “When a doctor recommends you take a test or have some surgery, ask whether the doctor would suggest that his or her spouse or children go through such a procedure. Contrary to popular belief, doctors can’t cure everyone. So why cause unnecessary pain with surgery? I think music and animal therapy can help more than most doctors imagine. “To stay healthy, always take the stairs and carry your own stuff. I take the stairs and take two steps at a time to keep the muscles moving. “My inspiration is Robert Browning’s poem ‘Abt Vogler.’ My father used to read it to me. It encourages us to make big art, not small scribbles. It says to try to draw a circle so huge that there is no way we can finish it while we are alive. All we see is an arch, the rest is beyond our vision, but it is there in the distance. “Pain is mysterious and having fun is the best way to forget it. If a child has a toothache and you start playing a game together, he or she immediately forgets the pain. Hospitals must cater to the basic need of the patients. We all want to have fun. At St. Luke’s, we have music and animal therapies and art classes. “Don’t be crazy about amassing material things. Remember, you don’t know when your number is up and you can’t take it with you to the next place. “Hospitals must be designed and prepared for major disasters and they must accept every patient who appears at their doors. We designed St. Luke’s so we can operate anywhere — in the basement or the corridors, in the chapel. Most people thought I was crazy to prepare for a catastrophe, but on March 20, 1995, I was unfortunately proven right when members of the Aum Shinrikyo religious cult launched a terrorist attack in the Tokyo subway. We accepted 720 victims and in two hours, figured out that it was sarin gas that had hit them. Sadly, we lost one person, but saved 739 lives. “Science alone can’t care or help people. Science lumps us all together, but illness is individual. Each person is unique and diseases are connected to their hearts. To know the illness and help people, we need liberal and visual arts, not just medical ones. “Life is filled with incidents. On March 31, 1970, when I was 59 years old, I boarded a flight from Tokyo to Fukuoka. It was a beautiful sunny morning and as Mt. Fuji came into sight, the plane was hijacked by the Japanese Communist League-Red Army Faction. I spent the next four days handcuffed to my seat in 40-degree heat (104 degrees Fahrenheit). As a doctor, I looked at it all as an experiment and was amazed at how the body slowed down in a crisis. “Find a role model and aim to achieve even more than they could ever do. My father went to the United States in 1900 to study at Duke University. He was a pioneer and one of my heroes. Later I found a few more life guides and when I am stuck, I ask myself how they would deal with a problem. Since there was so much focus on the new pope this past week, we’ll wind up with a little humor on the subject. “I’m sorry, Your Holiness, but I cannot let you do that. I’d lose my job. What if something should happen?” protests the driver. “Who’s going to tell?” says the Pope with a smile. Reluctantly, the driver gets in the back seat and the Pope climbs behind he wheel. The driver quickly regrets his decision when after exiting the airport, the Pontiff floors it, accelerating to 120 miles per hour. “Please slow down, your Holiness,” pleads the driver, but the Pope keeps the pedal to the metal until they hear a siren. “Oh my God, I’m going to lose my license and my job,” moans the driver. The Pope pulls over and rolls down the window as the cop approaches, but the cop takes one look at him, goes back to his motorcycle and gets on the radio. “I need to talk to the chief,” he tells the dispatcher. The chief gets on the radio and the cop tells him that he’s stopped a limo going 150 miles per hour. “So bust him,” says the chief. “No, I mean really important,” says the cop.